Newt Gingrich says Mitt Romney's space plan doesn't go far enough. 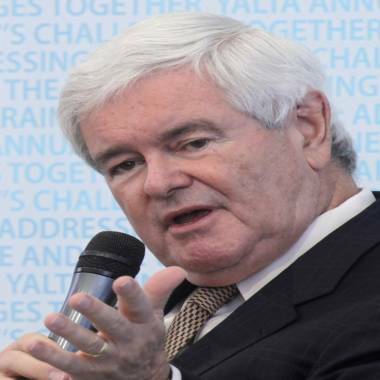 BELOIT, Wis. – One-time presidential hopeful Newt Gingrich, who promised during the GOP primary to create a U.S. moon colony if elected, criticized Mitt Romney’s plan for space exploration as not being “robust” enough. Saturday, Romney’s running mate, Rep. Paul Ryan, laid out the campaign’s plan during a townhall meeting in Orlando, Fla., and accused President Barack Obama of “dismantling” America’s space program. During the long Republican primary season, Gingrich regularly spoke about fixing the space program after the cancellation of American space shuttles. Speaking in Cocoa, Fla., at the end of January, Gingrich vowed the United States would “have the first permanent base on the moon” and by the end of 2020 the country would have "the first continuous propulsion system in space" capable of allowing people travel to Mars. Romney, whom Gingrich later endorsed for president after suspending his campaign in May, mocked the former House speaker for proposing a lunar colony during one of the several GOP debates earlier in the year. "I spent 25 years in business. If I had a business executive come to me and say they wanted to spend a few hundred billion dollars to put a colony on the moon, I'd say, 'You're fired,'" Romney said at the debate in Jacksonville, Fla., co-hosted by CNN, the Republican Party of Florida and the Hispanic Leadership Network. "The idea that corporate America wants to go off to the moon and build a colony there, it may be a big idea, but it's not a good idea." Under a President Romney administration, there would be four space priorities: focusing NASA, partnering internationally, strengthening security, and revitalizing industry. The steps put forward by the Romney-Ryan ticket do not go far enough in Gingrich’s eyes. “I was with Richard Branson in Yalta last week and his commitment to a dynamic private secure entrepreneurial model that works with innovators and risk-takers to put people into space inexpensively (compared to government rates) is a big example of the future,” Gingrich said in an email Sunday. Branson, the entrepreneur and CEO of Virgin Airlines, is launching Branson's Virgin Galactic which will offer commercial space flights as the government closes down it’s space shuttle operations.